The NFL has fined Arizona Cardinals defensive end Calais Campbell $18,231 for his low hit on Carolina Panthers quarterback Cam Newton, a source told ESPN's Dan Graziano, confirming multiple reports. Campbell's fine was first reported by USA Today, which also noted that he is appealing, citing a person with knowledge of the situation. The hit did not draw a flag, but the league has since admitted Campbell should have been penalized for roughing the passer. 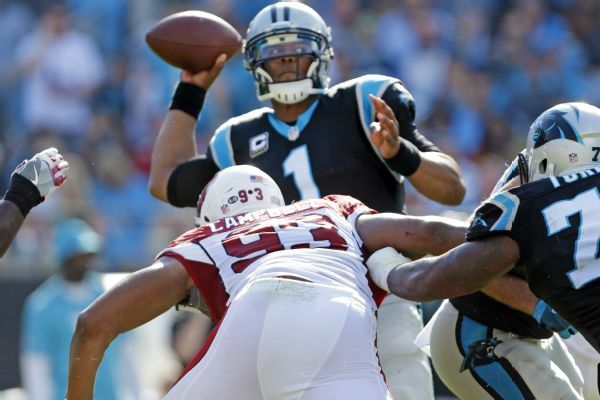 After Sunday's 30-20 victory over Arizona, Newton complained about not receiving the same treatment as other quarterbacks regarding late hits in the pocket. The NFL MVP said the breaking point was the non-call on Campbell's hit below the knees in the third quarter. On Wednesday, Newton said he had a "great discussion" with NFL commissioner Roger Goodell about the number of hits he takes in the pocket. "I got my point across. He got his point across. That's it," Newton said a day after he talked to Goodell by phone. ESPN's David Newton and The Associated Press contributed to this report. Panthers quarterback Cam Newton said he had a great conversation with commissioner Roger Goodell on Tuesday on hits he takes in the pocket and hopes things will change.